News Photo by Jonny Zawacki Alpena’s Jade Schultz goes up and scores a layup while being defended by Tawas Alexandra Frank (34) during the first quarter of a girls basketball game on Monday at Alpena High School. 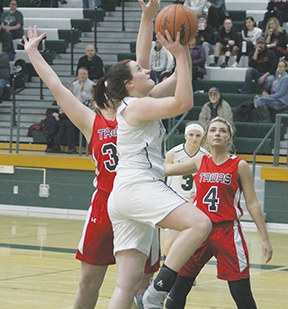 Despite not being able to practice much lately due to weather and cancellations, the Alpena High girls basketball team put together a strong performance Monday in a 47-39 victory over Tawas. The Wildcats got up and down the floor and played with a lot of energy in the first half as they built an early lead and put together a solid all around performance. The layoff didn’t appear to affect Jade Schultz much as she led all scorers with a game-high 19 points on the night to propel the Wildcats to victory. Schultz was dominant early, scoring nine points in the opening quarter, including a layup to beat the buzzer after she grabbed an offensive rebound to give Alpena a 16-5 lead after one quarter. The Wildcats held their lead during the rest of the half and took a 19-17 lead into the break after playing strong at both ends of the floor. Early in the third quarter, Tawas tried to get back in the game as the Braves scored eight of the first 11 points. That cut the lead to 32-25, which forced Andrews to call a timeout and let her team regroup after their only letdown of the night. “We have a lot of big games coming up and we tried to work on a few things tonight, especially working in our press and work through the press and get some shots out of it and block out because we haven’t done a good job of that lately, but we did a better job of that tonight,” Andrews said. The Wildcats responded after the timeout by scoring the nine points to end the quarter and take a comfortable 41-25 lead into the fourth quarter. Alpena scored the first four points of the fourth to take its largest lead of the night. Tawas did everything it could to get back in the game and the Braves scored 10 unanswered to cut the lead back to 45-35. Tawas ran out of time however as the Wildcats controlled the ball in the final minute to come away with the victory. The Braves got a valiant effort from Carley Bolen who scored a team high 17 points. Alexandra Frank added nine points and Lexi LaJoice chipped in with six points. 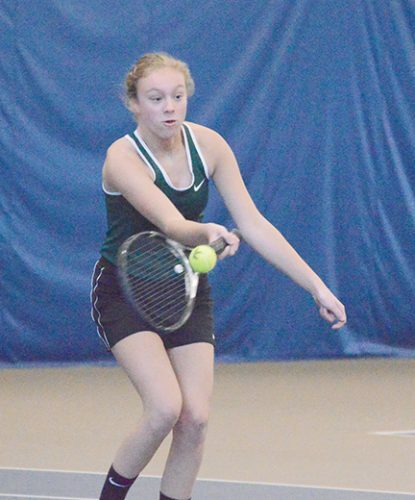 Along with Schultz, Alpena got six points apiece from Allie Funk, Maddie Voltz and Mollie Girard. 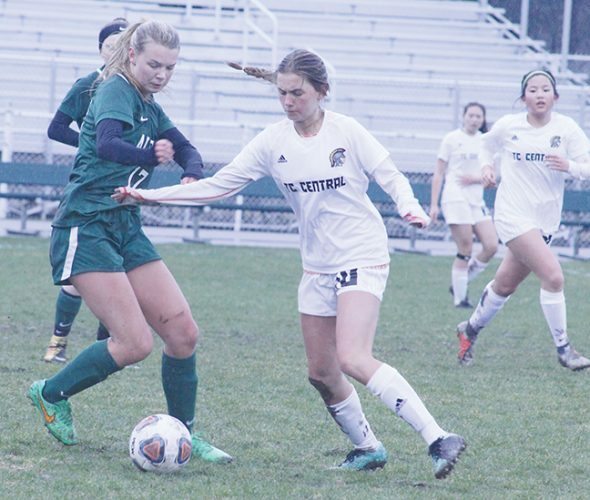 The Wildcats improve to 7-6 overall on the season and will have a key Big North Conference game on Friday when they play host to Traverse City Central. The Alpena JV team picked up a big 63-13 win over Tawas. Jenna Leeck led the Wildcats with 17 points. Alexis Jones finished with nine points and Alli Losinski collected seven points. 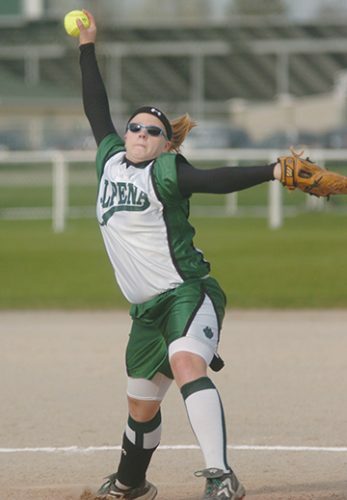 ALPENA (47): M. Girard, 2 2-2 6; M. Dickinson, 1 0-0 2; A. Johnson, 0 1-2 1; J. Schultz, 7 5-7 19; M. Voltz, 2 2-2 6; Abbie Funk, 1 0-2 3; Allie Funk, 2 1-2 6; A. Young 2 0-0 4. 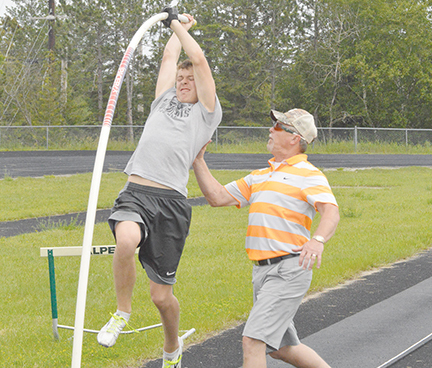 TAWAS (39): C. Bolen, 7 1-2 17; A. Szostak, 1 0-0 3; L. LaJoice, 3 0-0 6; M. Kaycee, 1 0-0 2; O. Wallace, 1 0-0 2; A. Frank, 4 1-2 9.